The Blue Door Cafe and Bakery in Cuyahoga Falls began as a micro-bakery in 2009. They then bought the restaurant they were working out of and now consistently produce some of the most delicious food you will ever eat. The folks at The Blue Door pride themselves on using local and healthy ingredients and having a seasonal menu that changes specials frequently. In addition to the standard breakfast and lunch menu the specials are created based on what delicious and special ingredients they are able to purchase that week, using carefully chosen shrimp, salmon, bison, etc. They are closed on Monday and Tuesday, but open for breakfast and lunch Wednesday through Sunday from 7 AM to 3 PM. They recently started expanding to include dinner service on the weekend. Dinner is served Thursday, Friday and Saturday nights from 6 to 9 PM. Reservations are recommended. The dinner service feature four entrees, and each includes freshly baked breads and rolls and specially created non-alcoholic cocktails that utilize fresh seasonal fruits and vegetables. I love the fact that the Blue Door has a more European atmosphere. 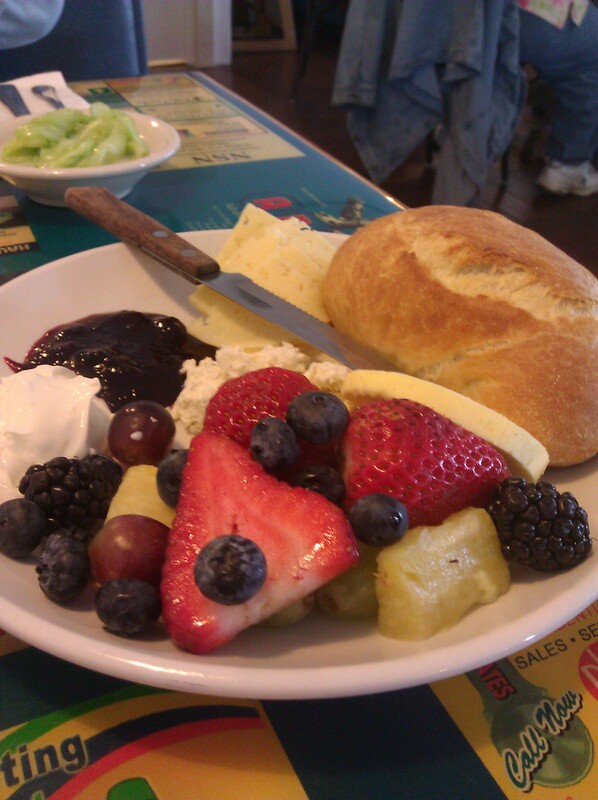 In fact, news of a German breakfast week was the first meal to tempt me to drive down to Cuyahoga Falls. The fact that they had made my favorite German cake, Bienenstich or Bee Sting Cake, into a French toast convinced me that I needed to get down there right away. It was divine, featuring custard and honey with their Challah bread. I couldn’t decide and also felt the need to have a typical German Frühstück too, so I also ordered the bread roll with various cheeses and jams as well as fresh fruit. I don’t know where they get their fresh fruit, but it is amazing and consistently perfectly ripe. I then started following them on Facebook, where they frequently post their specials for the week. 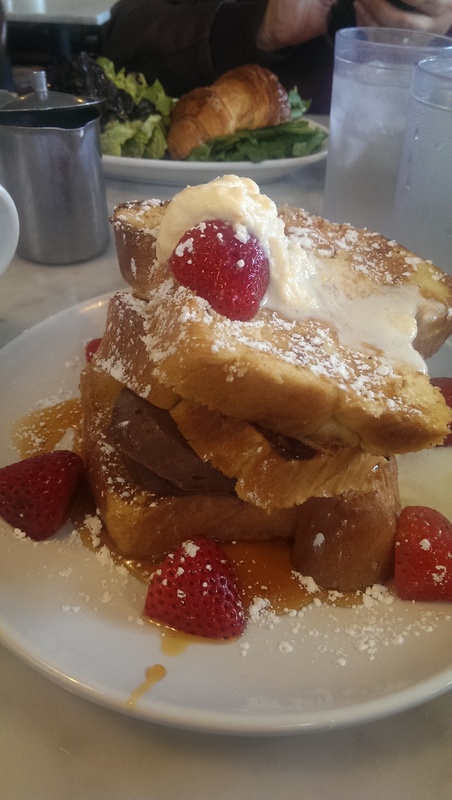 My friend Tom is completely hooked and lives closer, so when he posted one day that the special was a Nutella and Chantilly Cream French toast I called my friend M. and picked her up within 15 minutes to make the drive down there. She had the egg sandwich on one of their house-made croissants (I dare you to have one and not want to take several home with you!). We shared both entrees. 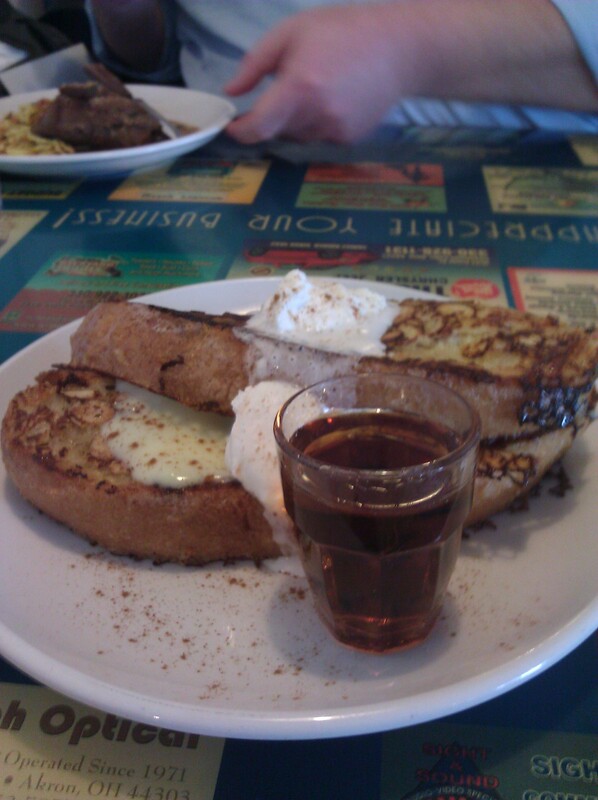 Her sandwich was good, but my French toast was exquisite. Funnily enough that day the person sat at the table next to us was one of my good friends and a fellow German translator (who lives in Kent), so we pulled the tables together. Then about 20 minutes later another translator colleague (who lives in Pepper Pike) walked in. I guess we translators know where the good places to eat are! The two photos with the paper were recent to-go orders – a lobster ragout crepe and a New York bagel with lox, house-made cream cheese and capers. Both were fantastic! This is not an easy place to go on the weekend for breakfast, because it is so popular. Expect a wait. I tend to go during the week instead. I met a dining group from Meetup.com here for brunch last month. We were told the wait would be an hour and a half. It ended up being shorter, because several of our members managed to get their own tables and the group managed to snag the seats at the counter. Not the most comfortable place for a group breakfast, but everyone was happy with their meals. The service was great, and the coffee was flowing. They also have fresh squeezed orange juice that is just delicious. I ordered a bison burger on this day. It was perfectly cooked, and the leftovers were just as good later for dinner. The homemade cole slaw really convinced me to order it, and the slice of tomato was extremely fresh. You can see the potato croquette behind the burger in the photo. I love a good croquette, but was expecting something a little more delicate. This was more a potato fritter. Even though this wasn’t quite what I was expecting it was still quite delicious. As I said, they recently started serving dinner service. He managed to win over the chef from Dante’s Akron restaurant, Torsten Schulz. Another German! (Did I mention the owner speaks German fluently?) The two photos of small bites (smoked trout with horseradish cream and Maultaschen – a veal stuffed dough pocket in broth) were from a recent German wine dinner that was simply outstanding. Be sure to check out Tom’s Flickr feed to see the weekly creations. His photos do the food much better justice than mine do, so be sure to click on the links below. To be honest, I wasn’t as impressed with the regular dinner service as I wanted to be. The Ohio Strawberry non-alcoholic cocktail was divine. I enjoyed the first course, the Avocado Puree, very much. The avocado puree paired really well with the grapefruit slices. My grass-fed beef was good, but it had a little too much fat. I liked that there were two variations and couldn’t decide which I liked better. The potato and spinach sides were really small, which was disappointing because I love mixing a bite of spinach with steak. The vegetarian entree (Variations of Ohio broccoli) had a high price point that my vegetarian friends did not feel was warranted. They used four different kinds of broccoli and pureed them together, serving them with Japanese rice, almonds and a lemon vinaigrette. The dessert, the Marillenknodel (apricot dumpling), was very good. 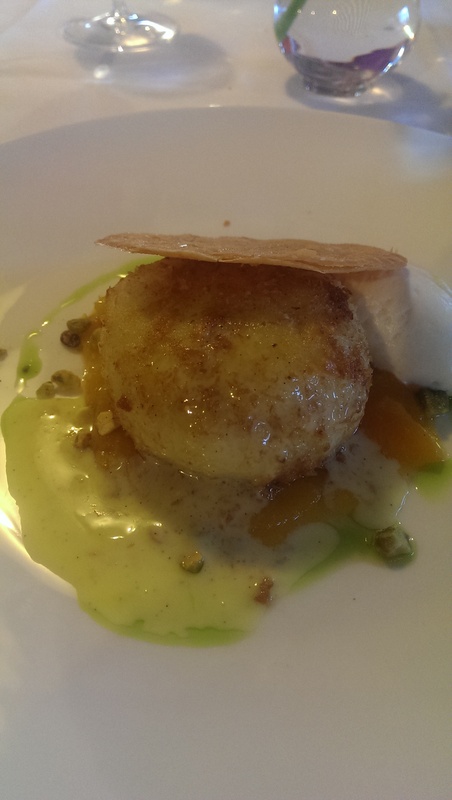 It is a take on a standard Austrian dessert that I love, featuring a Viennese dumpling, vanilla sauce and pistachios. The souffle (see photostream) looked super-inviting as well. Although dinner was a nice change and I hope they are successful, I think I’m going to stick with their breakfast and lunch service, since that is my favorite meal of the day anyway. However, if you are looking for a restaurant for a special occasion, consider trying The Blue Door.